For this post we’ll be throwing you some tips for how to be a successful vlogger on YouTube in 2018. 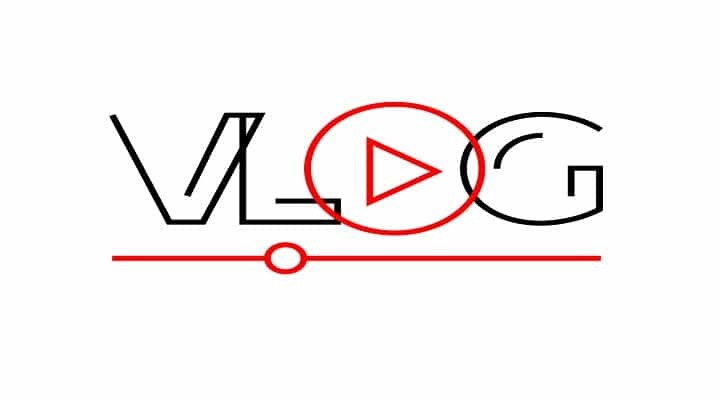 There will be a mix of video recording related tips, YouTube Optimization tips & much more. Let’s start with the one I find the most important. What I mean by picking a niche is try to keep (most) of your vlogs centered around one main topic. Example: Let’s say you start a vlogging channel about fitness. You put out a good bit of videos, start gaining some followers. Next thing you know you’ve started putting out more vlogs about building model trains instead of fitness. I’m not saying do every vlog about fitness. Maybe 3 vlogs a week can be fitness, 1 can be your model trains & one other can be a vlog of you having a conversation with your dog. There’s no exact formula for this & tons of vloggers have success without doing this but I’ve seen a lot more new vloggers have better success with keeping some sort of theme to their channel. Hopefully, you get what I’m attempting to say here. Just don’t be all over the place with what you vlog about, pick a niche & try to be the best vlogger in that niche. Rather than uploading 10 vlogs while you sit on your couch rambling about nothing, take that time to make 1 awesome vlog instead. This could mean either going out while you vlog (a walk outdoors or the comic book store) this gives you much more to talk about & also a different scene for your viewers. Along with that, also take some extra time to edit your video. Nothing crazy here just some simple stuff, like music at certain parts of the video or a text caption here n there. There a few things to cover here. Don’t title your videos Vlog 7, Vlog of the day & crap like that. Make it enticing for user to click on if they come across it. If you can’t do that then at least try to give some insight on what the vlog is about. The thumbnail image is what users first see when scrolling the the video list. This & your title are the two biggest opportunities for you to get the user to click on your video rather than someone else. A great thumbnail usually has a text overlay of what your video is about. If you’re not so much feeling the editing side of things, then don’t stress it. Just try to put a good looking image as your thumbnail that goes with the topic of the video. Pfft, no one actually reads the video description. Why, Should I even waste my time filling it out? When someone goes to search for a video about something, how do you think YouTube decides what are actual relevant videos to what you’re searching for? I’m not saying that it for sure helps you rank for search terms but if it does wouldn’t that 2 minutes it take to fill out the description be worth it in the long run? You decide. I want to look back around to the video title & give it a little more of a focus because, well just keep reading you’ll see. Here is an example to explain this better. I searched for the phrase “youtube ranking factors” on YouTube. Here are the first 4 videos. As you see the first video has the actual phrase we’re searching for in the video title. Now, this is really only a small ranking factor among st however many YouTube uses to rank their videos. This means that just because the video title has the keyword in it like video #4, it’s not automatically going to rank over video that don’t. However, it will help some. 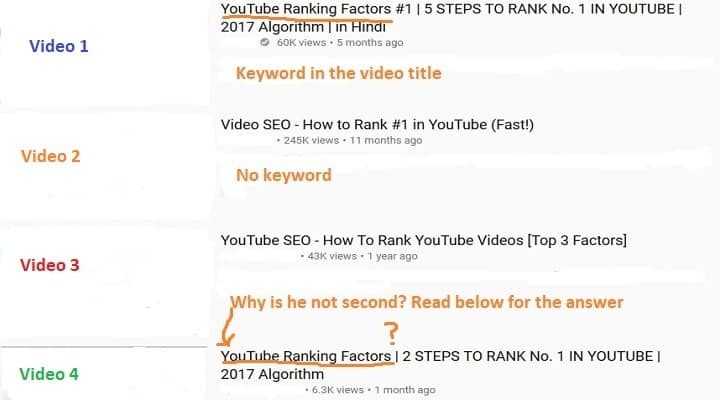 Note: When it says “No Keyword” beside video #2 I meaning that actual phrase of “YouTube Ranking Factors”. With him having the words “Rank” & “YouTube” in his title those are considered keywords for that search, just not the exact match that I was searching for. Just wanted to clarify that in case anyone was wondering, why he was ranking at all for that phrase. The title does relate to my search term. Be sure to read more of Brians article that I linked above if you’re wanting to dive into the more detailed information how YouTube ranks videos. By no means am I saying this actually needed, as I’ve seen plenty of decent vloggers make good videos with only their cell phones. These are just some things to consider if you feel that your videos are lacking in certain areas compared to other vloggers who do have this type of equipment. This goes with the having a niche for your videos part that we talked about above. Even though it might be easy to just talk about what you did today, who broke up with who or any drama nonsense it will get old quick unless you have an awesome personality to keep people coming back. The alternative to that is focus each video you do around a topic within your niche where you talk about specific things people are wanting to know, show them how to do or whatever, depending on what type of channel you have. There’s a few different ways to go about this. If you’re knowledgeable in the niche already then this will be much easier for you to know what users are searching for. If you need some tips you can try out these to get some vlog topic ideas. Straight up ask your current viewers what they would like to see. I see so many people come into vlogging thinking it will be there ticket to making lots of money overnight just by throwing up a few videos they make while commuting to & from work. Then they lose patience after a couple of months, then call it quits. This game takes time & you’ve got to keep on grinding it out if you want to make it. If you’re hoping to bank off one of your videos going viral then know that the chances are very slim. Rather your videos as a whole will usually be the causation for those views starting to get up there. I’m going to end this article on this note. Consider this a first draft, if you will. I look to add a whole lot more into this in the near future! Hope this has helped some of you out there.